From his appearance, blaster in hand, in Episode IV: A New Hope , Greedo the bounty hunter became the Star Wars symbol of feckless overconfidence at a near Shakespearean level. He’s shot dead in the middle of a speech about his superior skill and luck, then is defeated at every other appearance in flashbacks on his life. Greedo dies by the hand of Han Solo in A New Hope. Courtesy of LucasFilm/Disney. In a deleted scene from Episode I: The Phantom Menace , a young Greedo is beat up by Anakin Skywalker after accusing the human boy of cheating to achieve his victory at the Boonta Eve Classic Podrace. (Watch the scene on YouTube.) Greedo is defeated before ever taking a swing—at Skywalker or Solo. In the theatrical release of A New Hope, Han Solo shoots Greedo before the hapless bounty hunter can get off a shot. Although Lucas would later change the altercation multiple times in the 1997 Special Edition, 2004 Trilogy DVD box set, and the 2011 The Complete Saga Blu-ray releases of A New Hope, most fans consider the theatrical release definitive, thus proving empirically that Greedo was killed without returning fire. His death is thrice foreshadowed by the one-sided brawl in The Phantom Menace. First, Greedo’s mouth initiates both the quarrel with Skywalker and the one with Solo, while it’s his opponents who end their respective altercations. Next is the fact that Greedo is never shown to strike Anakin; with Anakin atop him, Greedo is punched but merely struggles ineffectually rather than returning with a shot of his own. The final foreshadowing is more obvious and direct. After the fracas with Skywalker is ended, fellow Rodian child, Ward, admonishes young Greedo that he should “be careful who [he messes] with,” that he will “come to regret it.” Thirty years later, in a dirty corner of Chalmun’s Cantina at the Mos Eisley spaceport, Greedo demonstrates a failure to learn the childhood lesson and suffers the final consequence of that deficiency. Those two aren’t the only occasions on which we see Greedo’s overconfidence and ineptitude. Greedo losing a fight he instigated with Anakin Skywalker in The Phantom Menace. Courtesy of LucasFilm/Disney. During the Clone Wars, as chronicled by the animated television show Star Wars: The Clone Wars , Greedo works as a bounty hunter in the employ of Jabba the Hutt—the same vocation and patron as when we later meet him in A New Hope. In the episode titled “Sphere of Influence,” the Trade Federation engages Greedo and a team of associates to kidnap the daughters of Pantora planetary Chairman Papanoida, the character whom George Lucas himself portrays in a cameo appearance in Episode III: Revenge of the Sith . The Trade Federation hopes to use the abduction as leverage sufficient to force Papanoida to commit Pantora to membership in the Confederacy of Independent Systems (CIS). Greedo’s ineptitude causes him to be instantly found out, and his cowardice before Chairman Papanoida and Jabba the Hutt sees him readily admit culpability. He then leads Papanoida to where his associates are holding the kidnapped daughters. The confrontation results in a blaster fight, with Greedo cowering behind an overturned table in the same cantina in which Solo would later kill him. Because of Greedo’s overconfidence and pusillanimity, the Trade Federation’s plan backfires, ultimately strengthening Pantora’s membership in the Republic and removing the trade embargo previously levied against the planet by the Trade Federation. Greedo fails again during the Clone Wars. Courtesy of LucasFilm/Disney. Behind the scenes, the green-skinned Rodian is just as luckless. Two actors portray Greedo in A New Hope. Paul Blake is the actor in the costume and simple rubber mask during the majority of the scene in which Greedo confronts Solo, while actress Mara De Aragon dons a more advanced, animatronic-infused mask during the close-up shots. De Aragon’s mask is fitted with wires and articulators to affect the movements of Greedo’s ears, antennae, and mouth. Unfortunately, just before filming begins, the mouth animatronics malfunction irreparably. At the behest of George Lucas, the actress then manipulates Greedo’s elongated mouth by using a wooden clothespin held between her teeth. The final footage of the clothespin-articulated snout remains in all editions of the film. The mask, with its attendant armatures, wires, tape, and padding, leaves little room for De Aragon to breathe, and, during one period of prolonged setup, rehearsal, and shooting, she finds that she can’t, in fact, draw a breath—nor can she remove the mask herself because of the clumsiness of the costume’s gloves. Fortunately, she manages to gesticulate to Lucas, alerting him to her predicament; Lucas removes the mask, and grants De Aragon more frequent breaks from wearing it during filming. The fateful encounter in the Cantina moments before Greedo’s death. Courtesy of LucasFilm/Disney. As cumbersome as the Greedo costume is, it was nearly a very different design. Early sketches for the character first have him as four-armed and then two-armed but hirsute and betailed. Beyond film and animation, Greedo receives a little more, though no more heroic, attention. He appears, or is mentioned in, several comics and graphic novels from Dark Horse Comics, including Episode I: Qui-Gon Jinn and Underworld: The Yavin Vassilika . As a prominent character in the Cantina Scene, Greedo is naturally included among the character vignettes in The Mos Eisley Cantina Pop-Up Book . The largest non-Canon appearance of Greedo is in the never-was-Canon anthology Tales from the Mos Eisley Cantina . As the short stories focus on the backgrounds and adventures of a number of patrons present in Chalmun’s Cantina that fateful day when Skywalker met Solo and Solo killed Greedo, Greedo is mentioned or factors into several tales. He stars in “A Hunter’s Fate: Greedo’s Tale,” written by Tom and Marth Veitch. 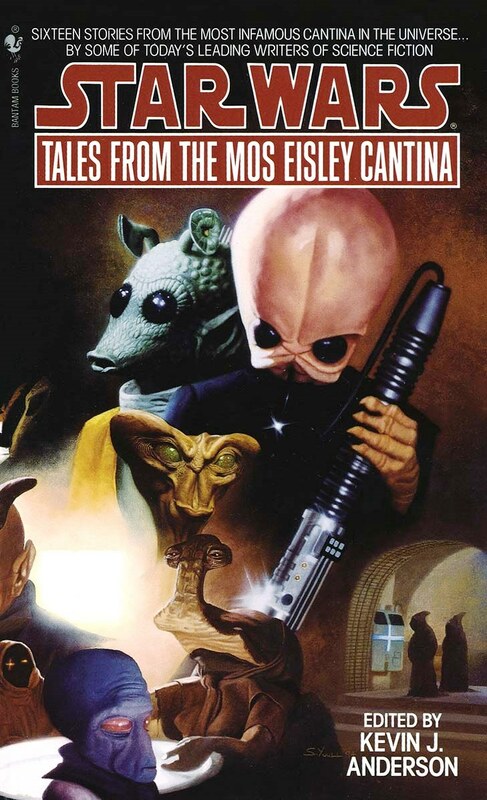 Tales from the Most Eisley Cantina, featuring “A Hunter’s Fate: Greedo’s Tale.” Courtesy of Bantam. “A Hunter’s Fate” recounts Greedo’s childhood of isolation, persecution, and running from his clan’s tormentors. He is born on Rodia, to the wealthy bounty hunter, Greedo the Elder, and into the Tetsu Clan. His father’s rival, Navik the Red, murders the Greedo the Elder and subsumes the family wealth. Neela, the mother of Greedo the Young, the star of the story and this article, goes into hiding with her son and two hundred others of her clan. The junior Greedo is raised on the jungle planet U-Tendik, isolated and ignorant of not only the ways of the galaxy but of his family history, until Navik the Red comes calling again. Greedo, now a teenager, flees with the rest of his clan to the lawless “Smuggler’s Moon” Nar Shaddaa. After learning his way around the underworld of Nar Shaddaa, Greedo and his family relocate again to the not-too-distant Tattooine. Settling into Mos Espa, Greedo becomes a petty criminal and thug, working his way up through low-level enforcing, to eventually hunt bounties for Jabba the Hutt, the crime lord of Tattooine. “A Hunter’s Fate: Greedo’s Tale” has also been adapted to a visual medium in the form of the Web comic strip of the same title by Pablo Hidalgo. 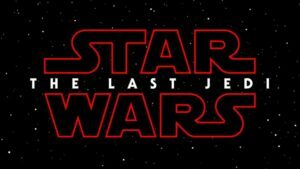 It was published in the members-only area of Hyperspace, the Official Star Wars Fan Club formerly housed at StarWars.com. Hyperspace was closed by LucasArts in 2011, though portions of the webstrip can be found around the Web. An installment of the Webstrip “A Hunter’s Fate: Greedo’s Tale”. Courtesy of Hyperspace. If you want to indulge in role-playing a mistakenly self-professed great bounty hunter, or you want to try to redeem the defeasible Rodian, you can play him in the Star Wars: Battlefront video game and the Fantasy Flight tabletop game Star Wars: Imperial Assault. 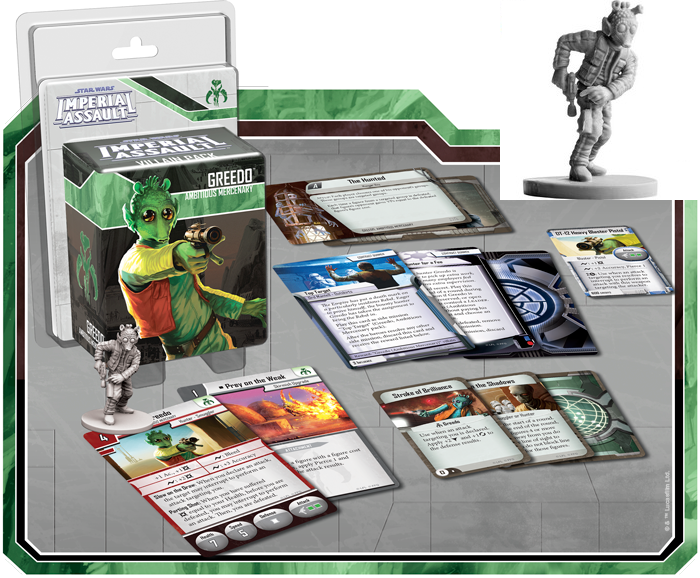 Greedo’s character card and miniature is available for Star Wars: Imperial Assault in the Greedo Villain Pack, with the paintable miniature depicting him frozen for all eternity in a slow-draw pose symbolic of the true circumstances of his demise. The Greedo Villain Pack with Greedo miniature (inset). Courtesy of Fantasy Flight Games. Thank you for this comprehensive Greedo digest. You are truly a scholar.